A great addition to any collection and ‘after dinner’ subject. Many of us keep but don’t wear them, hoping the ‘other sock’ will turn up as mysteriously as it disappeared; they rarely do. True or false, what are your thoughts on this? A light hearted yet provocative look via the medium of painting at experiences we all have, usually dismiss and yet, maybe they are significant…? The physical dimensions of this painting are 121 x 121 cms (48″ x 48″), oils on canvas, available, £3,000. *What are the trans physical and psychological dimensions? *How should I complete this painting, does it have a life of its own, or is it already complete? *who or what is God? *Why don’t women get 72 virgins? Can you add to or answer these questions? Complete colour blindness is very rare, more often we have a complex colour response that is not ‘colour normal’. The authoritative Francis Pratt of the Painting School of Montmiral with whose assistance and mentoring I conducted numerous colour experiments calls it ‘special eyes’, having naturally a sense of colour vision many painters strive all their lives to attain. They, we, learned to use this to create what appear to ‘colour normal’ people, delightful colour surprises. “A surprisingly large proportion of the more celebrated Impressionist, Post-Impressionist and early Modernist painters were short-sighted. This meant that when they were making paintings of landscapes they could see what they were painting clearly but what they were looking at was blurred. Renoir and Cézanne are known to have seen this as an advantage. Albrecht Dürer had one lazy eye. This helped him with drawing from observation because using two eyes makes it more difficult to look at relationships between objects and their context. Presbyopia (i.e. long-sightedness due to age) may have helped in producing much-appreciated stylistic developments of the later years of certain artists, including Titian and Rembrandt. The visual capacities of both Monet and Degas degenerated in their later years with positive effect for future generations. The former’s cataracts acted as red filters and explain the astonishingly red paintings he made towards the end of his life, which many forward-looking young artists found particularly exciting. Degas suffered from a progressive failure of the colour receptors in the central part (the fovea) of the light-capturing receptor mosaic at the back of his eyes (the retina) leaving him more and more dependent on the colour-creating potential of the rod receptors in the periphery. From around 1886, to compensate for the growing difficulty of seeing clearly, he started to double the size of his paintings. Progressively his mark-making became looser and his colours brighter. Moreover, since the rod receptors, which he was now forced to use, absorb light of a different wavelength to the cone receptors which dominate normal colour vision, his later paintings contain a choice of colours that strike modern eyes as unusual and exciting”. 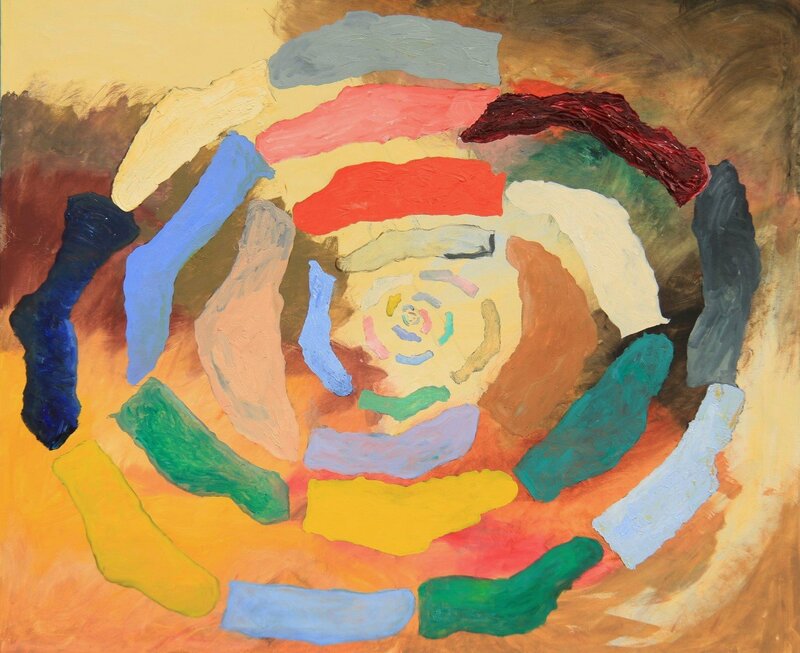 Painted by Gordon Frickers ‘Odd Socks’ measures 121 x 121 cms (48″ x 48″), oils, available, £3,000.